Fort Washington, erected in late 1814 at the east end of the “The Lines” of Charleston. Technically speaking, the mission of the Mayor’s Walled City Task Force is to raise awareness about the colonial-era fortifications erected in urban Charleston. But I’ll go out on a limb for a moment and guess that readers of this blog might also be interested in learning about some of Charleston’s post-colonial fortifications. Shortly after Britain and France declared war on each other in 1793, the South Carolina government began erecting new fortifications (such as Fort Mechanic in 1794 and Fort Pinckney in 1798) to protect Charleston against possible incursions of either of these dueling nations. As the United States drifted towards war with Britain in the early nineteenth century, local leaders took further steps to defend our port city. 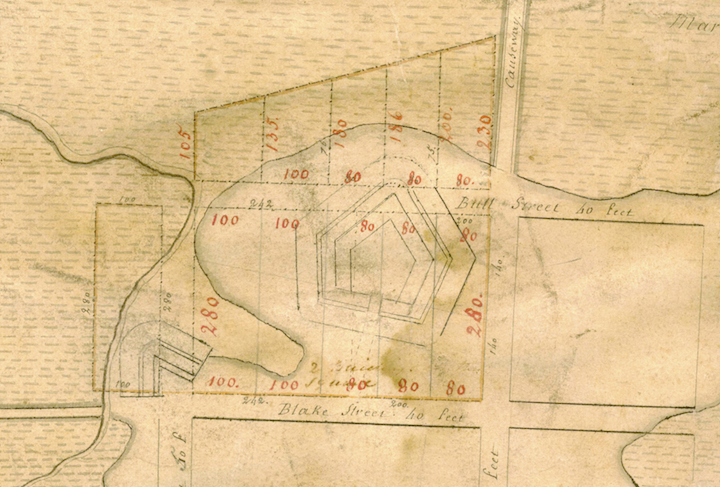 Besides improving Charleston’s existing harbor defenses (consisting of forts Johnson, Moultrie, and Pinckney), our intrepid citizens erected in 1814 a significant line of earthwork and brick fortifications across the “neck” of the peninsula, connecting the Ashley and Cooper Rivers. This half-mile-long, zig-zag entrenchment and moat was intended to defend the city against any hostile attempts to attack the city from the north, as the British army had done in the spring of 1780. Time: Wednesday, September 10th 2014 at 6:00 p.m.